The African American community has been interested in Asian culture dating back to the 1970s with the rise of the martial arts movie in America. These martial arts films gave birth to the fascination about the Asian culture in the community and in turn created films like Black Belt Jones. 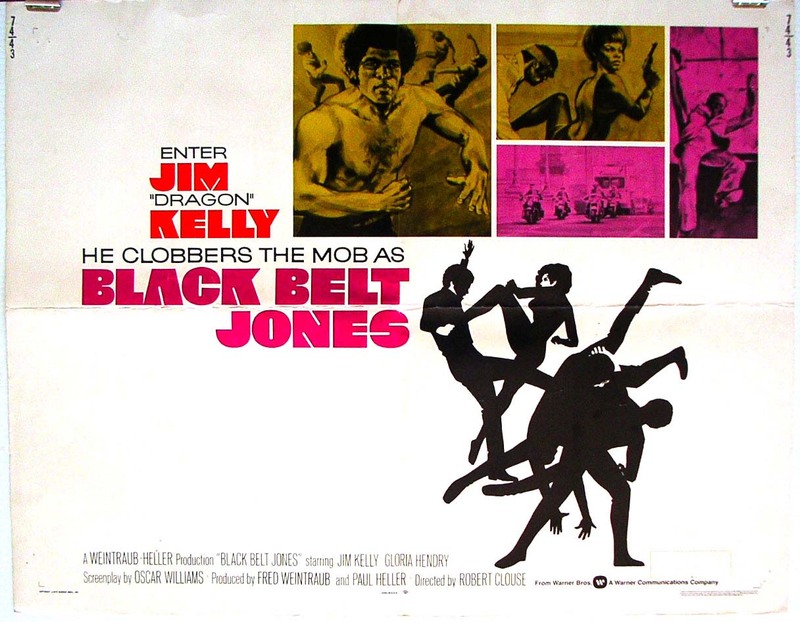 Black Belt Jones came out a year after Bruce Lee’s film Enter the Dragon. On the poster “Enter Jim ‘Dragon’ Kelly” is reference to the Lee film. The introduction of Enter the Dragon began a slew of martial arts fandom in the African American community. Films like Black Belt Jones were created to not only capitalize on the success of the martial arts films. Martial arts films and their blaxploitation counterparts began to create a form of intra-racial relationships between the African American culture and the Asian culture. This mixing of African American and Asian culture can be seen in many examples over the past several years. There have been television shows like Afro Samurai which have mixed samurai culture with that of African American culture. On The Boondocks one of the main characters Huey Freeman is an accomplished martial artist and makes several references to Asian/martial arts culture as well as some blaxploitation film characters. The blending of the two cultures can be seen in novels as well. In Paul Beatty’s The White Boy Shuffle the main character Gunnar Kaufman is given a mail order bride as his 18th birthday present from a friend. This marriage between Gunnar and his bride, Yoshiko, is a metaphoric marriage between the African American and Asian communities. While Yoshiko is a mail order bride, she ends up being a good match for Gunnar, an unlikely paring, which some would say about the growing relationship between the African American and Asian communities at the time. Over the years the African American and Asian communities have been coming together. This unlikely friendship is, in part, due to the rise of the martial arts film in the United States as well as the Blaxploitation films of the time. Posted in ENG359Curation3, SteeleAndrew and tagged Blaxploitation, Kung-Fu on April 30, 2013 by Drew Steele. Classic kung-fu films have enjoyed a unique relationship with modern African-American culture, both finding a common ground outside of the American majority. These films have consequently influenced some of the attitudes expressed in African American arts, including that of a hardened underground resistance to mainstream values and principles. 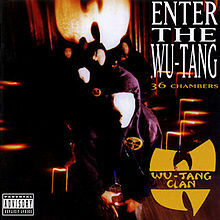 The album cover of Enter The Wu-Tang (36 Chambers) features a number of men standing in a dimly lit room. The men are wearing hooded jackets, all with the hood pulled tight around their heads, and are posed in aggressive forward-leaning stances, with the forefront individual’s finger pointing to the ground. Strangest of all, the men have no distinguishable faces, as if a spotlight washes out their features. Their faces also display a spectrum of color, with the ones closest to the front appearing to be white and then becoming gradually darker as they reach the background. The background of the image also displays the Wu-Tang’s symbol of a bird in a spotlight. The name of the album is displayed in the top-right corner and the name of the group in the bottom-right corner, again in front of the bird symbol and in a characteristically Asian font. The Wu-Tang Clan, an East Coast hip-hop group loosely comprised of nine rappers, is considered to be one of the most influential of all time. The group’s name comes from the 1983 kung-fu film Shaolin and Wu-Tang, while the name for their debut album was inspired by the 1978 film The 36th Chamber of Shaolin. The group was particularly ground-breaking in its approach to producing Enter the Wu-Tang (36 Chambers) by making prolific use of sampling from across the spectrum of music and from classic kung-fu films. Significant kung-fu samples are used on no less than three songs on the album, which de facto group leader RZA breaks down in an interview for Wired.com. Of these films, he remarks that “[t]he people who made these movies didn’t know how much one sentence could inspire” (Leckart). When speaking of the song “Da Mystery of Chessboxin’”, RZA explains that including kung-fu samples “was perfect for what I was trying to say about my crew. That’s how I felt Wu was-almost invincible” (Leckart). Not only does kung-fu culture provide a modicum for artistic expression in hip-hop, but its’ philosophy of power has influenced the approach both artists and their listeners have taken towards confronting their surroundings. The relationship between both cultures is so significant that they have in some ways become blended and intricately intertwined. In Paul Beatty’s The White Boy Shuffle, published only three years after the release of Enter The Wu-Tang (36 Chambers), Gunnar describes the unique role Ms. Kim plays in his neighborhood. She “was the half-black, half-Korean owner of the corner store. […] To us, when she was behind the counter in her store, Ms. Kim was Korean. When she was out on the streets walking her dogs, she was black” (Beatty 99). Vintage kung-fu and African-American cultures find new resonance and identities in American society through collaboration. In both finding themselves as a minority subculture, they have developed a particular philosophy of power that emphasizes empowerment through strength of conviction and body. Beatty, Paul. The White Boy Shuffle. New York: Picador, 1996. Print. Leckart, Steven. “Wu-Tang Clan’s RZA Breaks Down His Kung Fu Samples by Film and Song.” Wired Magazine. Wired Magazine, 23 Oct. 2007. Web. 28 April 2013. Posted in ENG359Curation3, ThomasAnne and tagged Hip-hop, Kung-Fu, Wu-Tang Clan on April 29, 2013 by athomas15.